Less than a week away from the election and Obama is still losing ground. The trend has continued over the last few weeks to the point now where both Rasumussenand Gallup are both reporting numbers within the margin of error. If the trend contunes through next week, and I see no reason it shouldn’t, we may well find out if those veiled threats from the Democrats about race riots will come true. Bottom line is for all the predictions that have been ourportion on the newswires, nobody has a freakin’ clue what’s going to happen… but I’m fairly sure it’s not going to be nearly as much a liberal success the Democrats have been making it out to be. I note with interest thatone of Obama’s speech writers has switched sides. Of course the Dinosaur media hasn’t noted it. They dare not. Obama is now accepting untraceable donations. He likes to tell us he’s popular based on the donations, but how many are illegal? So, the LA Times is hanging onto the Obama tape? Why, when they seemed to have no problem releasing the tape from Ahhnold. an you say ‘In the Tank?” I knew you could. Meanwhile, the Times continues to lay people off. Do the math, folks. Speaking of the press… I mentioned yesterday the Christian Science Monitorwas going to a weekly paper setup? Nope. Story NOW is they’re going to be web only I suppose this is to be considered ground-breaking… that is after all the way things are moving. But I wonder how many will see it so… and I wonder, too, what paper will be next? Could Bill Keller flying Coach be any indication? Gannett, which your humble blogger worked for breifly when Grok was clan leader, is cutting back, too. I gave the MSM my advice, in my comments on the CSM in yesterday’s Ramble. Failing to take that advice means they will not survive, as such It’s really that simple. They may not, anyway, but it’s the only shot they have, the way I see it. Billy goes on to make a seperate point from there. But I’m struck again about the conversations on the topics of rationality and Education we had here and here recently. Follow also the back and forth in the comments here. It’s all of a piece, people, and it’s not hard to follow. In fact, I’d suggest it’s hard NOT to follow. As I say at Q&O this morning, One cannot possibly avoid the correct path so carefully and exactly, by means of stupidity. 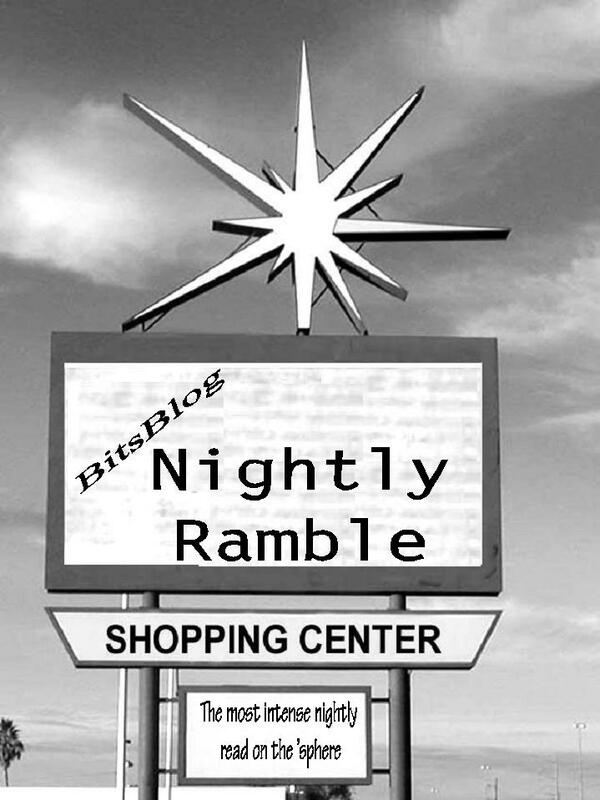 OK, I posted yesterday’s Ramble before I noted the market was going up.Seriously up. It’s up today a bit too, at this writing… around 3pm. But not nearly as much. Eventually, as I keep saying, this stuff take care of itself, given the chance. I note the news sources weren’t saying much about it. Perhaps the market kinda slipped off their radar? Oil, in response to the huge market push is now up above $67… pretty much on par with the market increase, and not unexpected. The BitsBlog Eric Blair award goes to Nancy Pelosi. This is what happens when sports figures… who it must be noted, are usually not the brightest bulbs on the tree to begin with… try to talk politics. As we go to press, the fed has lowered the prime interest rates to 1%.